Waikuku Beach Holiday Park is a well established site situated a short drive north of Christchurch, and is a popular spot for weekenders and International Tourists favour for their first or last night in New Zealand. The site is nicely positioned 100m from the beach, with a narrow strip of Forest that acts as a barrier to the ocean wind, the Ashley River Estuary is also not far from the Holiday Park, which is renowned for its Bird life. The General Store is a useful and very friendly store/takeaways 200m walk up the road, and more basic supplies are also available from the Reception.The beautiful Waikuku beach, which has excellent golden sand and solid surfing waves with the local Surf Life Saving Club patrolling the Beach over the peek times for your safety also within 50m of the Holiday Park are a Flying Fox, Play Ground and the world famous in Waikuku whale paddling pool. The site facilities are dated but functional, with 3 kitchens (1 new 2017) and 3 ablution blocks with Coin operated Laundries and token operated Showers, TV Room and a kid's playground. 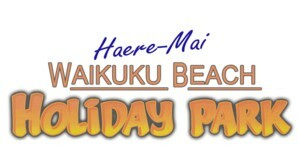 Waikuku Beach Holiday Park is a Family focused park with a very pleasant atmosphere and a lovely beach. Well worth a visit..